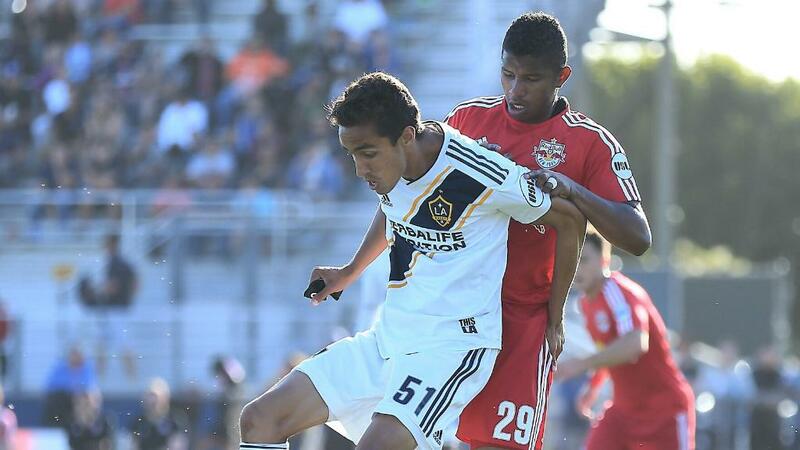 CARSON, Calif. – Wayward shooting cost LA Galaxy II dearly as Los Dos was forced to settle for a 1-1 draw with the New York Red Bulls II at StubHub Center Track and Field Stadium on Sunday evening. The Galaxy II started the match well, putting NYRB II goalkeeper Evan Louro under pressure in those early stages but couldn’t hit the target. That trend would continue throughout the whole first half as Los Dos starved New York of possession, but eventually that pressure told as the hosts opened the scoring thanks to Ethan Zubak, who slid in and stole possession before squaring the ball for Ulysses Llanez Jr., who ran onto the ball in space and hit it powerfully into the top-right corner of the net. New York thought it equalized five minutes later when defender Fidel Escobar headed home from a free kick but was denied by the offside flag. The start of the second half was a mirror image of the first as NYRB II had all of the ball, but struggled to get shots on target. Los Dos' Ariel Lassiter should have doubled the lead in the 68th minute when the ball was squared to him with an open net, but an extra touch allowed the defense to get back and block the shot. That miss seemed to spur LA on, with Lassiter trying to make amends in the 75th minute with a shot that was denied by a stunning Louro save. That save would prove crucial as New York found the equalizer three minutes later when Amando Moreno made a long run, breaking into the penalty area to get onto a flicked header by Stefano Bonomo before shooting into the right corner. Moreno's goal stood as decisive as a late LA Galaxy II push to salvage a point came up short as the points were shared. 1. The Galaxy II took the lead thanks to Ulysses Llanez Jr.'s first professional goal, but the hosts easily could have had more as they fell short of a first victory of the season on Sunday. Just four of Los Dos’ 16 shots were on target as chances to put the game away before New York's equalizer late salvaged a point for the visitors. 2. The Galaxy II has had a strong defensive performance with 128 tackles this year, the third-most in the league, a big shift from 2017 when Los Dos finished sixth from bottom in the same statistic. That effort has made LA much harder to break down but little lapses in concentration have cost the club throughout the season, and letting Amando Moreno in for one of New York's few good looks on goal continued that trend. 3. Despite having lost one match all season, the Red Bulls II have struggled to put together the kind of consistency the side has seen at home on the road so far this season. While the side has scored five goals in back-to-back home performances against 2017 postseason qualifiers Charleston Battery and Tampa Bay Rowdies, each result has now been followed by a 1-1 draw on the road against the Richmond Kickers and the Galaxy II, two sides that missed out on the postseason a season ago. Translating the side's home displays on the road would push New York into serious contention for a strong finish in the Eastern Conference. Ethan Zubak, LA Galaxy II – Dangerous up front for the Galaxy II all match, Zubak provided the assist for the Los Dos goal, just one of an incredible six chances he created in the match.